Propane Leak Detector Went Off In Our RV. What Do We Do? ANSWER: Hi Maureen, first and foremost you should get the propane system on your RV checked for leaks by a Certified RV Technician at least once a year. If you cannot remember the last time you had the propane system on your RV inspected than it is well overdue for inspection. A proper propane system inspection requires specialized equipment such as a manometer, etc. that is why you need a Certified RV Technician to perform the job. That being said; the fact that your detector went off once does not necessarily mean that you actually have a Propane Leak. 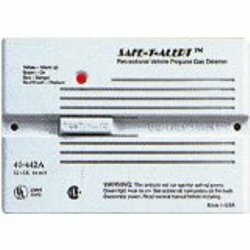 Normally a Propane Leak Detector like the one pictured at the top of this page will continue its alarm as long as it senses the presence of Propane. If your detector went off for a minute or two it may indicate that it may have detected another substance such as aerosol products (like hairspray), cleaning solvents, new RV odors, etc. and believe it or not even an animal or human passing gas (farting) can set them off. These detectors are very sensitive and the substances mentioned above can trigger them. that the batteries are receiving and holding a charge. Another fact that you need to be aware of is that Propane Detectors do wear out and that is why your Propane Detector has a manufacturing date on it. If the manufacturing date on your Propane Detector is over seven years old, you need to replace it immediately. An out of date Propane Detector is also more prone to giving false alarms. As I said earlier the Propane Leak Detector will continue to go off as long as it senses the presence of propane. You may not smell the propane leak as Propane is heavier than air and the fumes will stick close to the floor of the RV; plus the Propane Leak Detector is far more sensitive than your nose. In the event of an actual propane leak the steps you need to take are very simple get everyone including pets out of the RV immediately and shut off the main valve on your RV's propane containers. Depending on the year and type of RV you have the Propane Detector may have a solenoid in the propane system that automatically shuts off the propane to your RV. But to be sure shut off the main propane valve immediately. Comments for Propane Leak Detector Went Off In Our RV. What Do We Do? Ok, So we joined the club of sleepless nights when our alarm kepted going off for several days between 1 and 5:00 A.M. in the morning. It was our scented garbage bags under the sink and an automatic air freshener. I'm a new camper just bought a used 2013 Oasis Shasta and the second day camping the propane gas alarm went off at 3:30 am opened the door and after a while it went off again. I turned off the tank and it was fine. Next day during the day all went normal I cooked inside and everything but again at the same time the alarm went off. I thought the first time might have been a human gas but having it happen the second night same time made me think. Can there be something else that can cause the alarm to go off or make any gas smell come out, such as movement when we are asleep or something? I'm desperate I haven't slept since 3:30 am. passing gas (farting) can set them off - don't put the cat litter box or the bull terrier near the detector. I've had false alarms due to both. Be aware that the Propane/CO alarm can be caused by the water heater's exhaust. I camp in the Outer Banks of NC often and more often than not there is a strong breeze blowing. If the wind is blowing into your water heater the exhaust gases will blow into your camper causing the alarm. This is still an unsafe condition but something to consider as the source of your alarm.